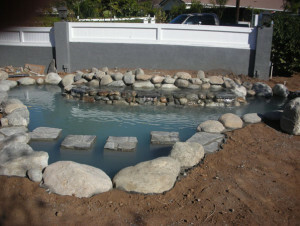 This pond with stepping stone bridge is a very unique pond design. The natural granite rocks mix well with the flag stone steps. This bridge has two functions. One naturally is to walk across the pond but also to give the fish a place to hide. The back of the pond has a triple waterfall . The falls are very short but enough movement to create a good amount of aeration. 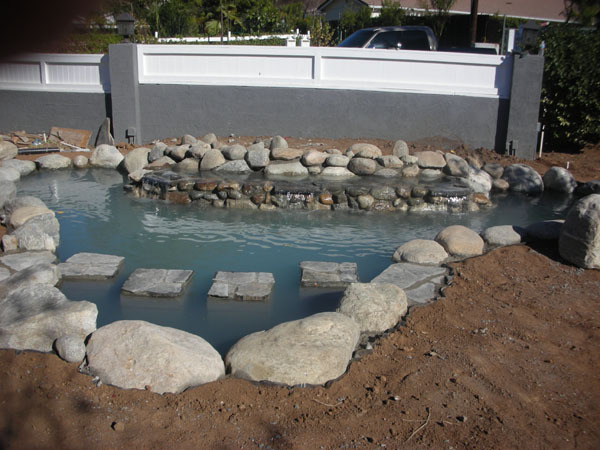 Aeration is important to keep your pond and pond fish happy and healthy.Your pond builder should encourage you to always keep your pond pumps and filter on 24/7. The addition of aquatic plants also creates oxygen as well as uses excess nutrients in your pond which helps to inhabit algae growth.